Activated alumina is prominently used as a reaction catalyst, in the oil and gas sector, and for the treatment of water. Growing investments in water treatment infrastructure and the ever-rising demand for oil and gas have been fueling the demand for activated alumina over the past few years. These trends are expected to continue during the forecast period, driving the market to expand at a CAGR of 4.2% between 2016 and 2024. The sales of activated alumina amounted to US$770.6 mn in 2015 and are projected to be worth US$1,108.9 mn by 2024. However, Transparency Market Research states that the threat from substitutes and the high regeneration cost in some of the end-use segments are likely to affect market growth. On the other hand, product improvement and the exploration of new end users are projected to provide lucrative growth opportunities for players in the activated alumina market. Activated alumina is widely used as a catalyst carrier, desiccant, and adsorbent in various end-use industries such as oil and gas, water treatment, biomaterial, pharmaceutical, and reaction catalyst. In terms of volume, the oil and gas sector held a significant share in the global activated alumina market in 2015. In the oil and gas sector, activated alumina is primarily used in gas and liquid dehydration. It is used to dry out gases such as cracked gas, LNG, and natural gas. The demand for activated alumina was also considerably high in the water treatment industry. Activated alumina is used for selective adsorption of heavy metals such as arsenic, selenium, uranium, and lead from water streams. It is also used for the defluorination of water. Asia Pacific accounted for more than 30% of the global activated alumina market in 2015, emerging as the leading regional segment that year. The increasing demand for activated alumina in the oil and gas and water treatment industries and a rise in the adoption of activated alumina in sulfur recovery units have been the prominent factors driving the market in Asia Pacific. The activated alumina markets in North America and Europe are anticipated to exhibit stable growth during the forecast period. In terms of country, the U.S. constituted a significant share of the global activated alumina market in 2015. Excess fluorine in water has been a major concern in the U.S and more than 60% of the total population in the country consumes fluoridated water. Activated alumina is employed in point-of-use or point-of-entry water treatment devices to remove excess fluorine in water. An increase in the production of oil and gas in the country is also estimated to drive the demand for activated alumina in the U.S. The consumption of activated alumina has been considerably high in China and the country plays an important role in the growth of the global activated alumina market. Rising investments in water treatment infrastructure, coupled with the growing demand for gas and liquid drying in the oil and gas industry, is projected boost the activated alumina market in China during the forecast period. India and several ASEAN countries are anticipated to provide substantial growth opportunities for the market in the next few years. The Middle East and Africa region is also projected to be a beneficial market for activated alumina by 2024. Activated alumina is primarily used as desiccant, adsorbent, catalyst, and catalyst carrier in water treatment, oil & gas, and pharmaceuticals, and the Claus process. It is a highly porous material with high surface area. This ensures superior moisture absorbing capabilities. Activated alumina also offers superior mechanical and thermal shock absorbing properties. It is produced through dehydroxylation of aluminum oxide. The report estimates and forecasts the activated alumina market on the global, regional, and country levels. The study provides forecast between 2016 and 2024 based on volume (tons) and revenue (US$ Mn) with 2015 as the base year. The report comprises an exhaustive value chain analysis for each of the product segments. It provides a comprehensive view of the market. Value chain analysis also offers detailed information about value addition at each stage. The study includes drivers and restraints for the activated alumina market along with their impact on demand during the forecast period. The study also provides key market indicators affecting the growth of the market. The report analyzes opportunities in the activated alumina market on the global and regional level. Drivers, restraints, and opportunities mentioned in the report are justified through quantitative and qualitative data. These have been verified through primary and secondary resources. Furthermore, the report analyzes substitute analysis of activated alumina and global average price trend analysis. The report includes Porter’s Five Forces Model to determine the degree of competition in the activated alumina market. The report comprises a qualitative write-up on market attractiveness analysis, wherein end-users and countries have been analyzed based on attractiveness for each region. Growth rate, market size, raw material availability, profit margin, impact strength, technology, competition, and other factors (such as environmental and legal) have been evaluated in order to derive the general attractiveness of the market. The report comprises price trend analysis for activated alumina between 2016 and 2024. 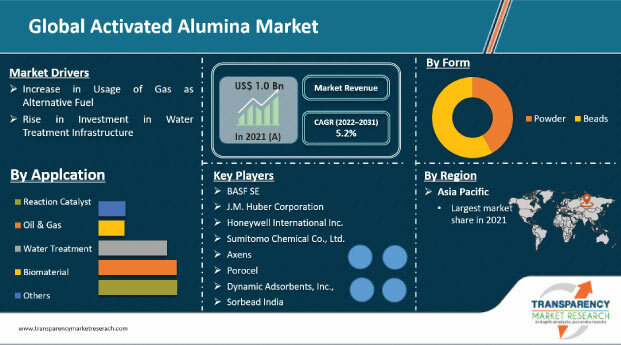 The study provides a comprehensive view of the activated alumina market by dividing it into end-user and geography. The activated alumina market has been segmented into reaction catalyst, oil & gas, water treatment, biomaterial, and others. The oil & gas segment has been further bifurcated into gas dehydration and liquid dehydration. End-user segments have been analyzed based on historic, present, and future trends, and the market has been estimated in terms of volume (tons) and revenue (US$ Mn) between 2016 and 2024. Regional segmentation includes the current and forecast demand for activated alumina in North America, Europe, Asia Pacific, Latin America, and Middle East & Africa (MEA). Additionally, the report comprises country-level analysis in terms of volume and revenue for end-user segments. Key countries such as the U.S., Germany, France, the U.K., Spain, Italy, India, China, South Africa, Mexico, and Brazil have been included in the study. Market segmentation includes demand for individual end-users in all the regions and countries. The report covers detailed competitive outlook that includes market share and profiles of key players operating in the global market. Key players profiled in the report include Albemarle Corporation, Axens, BASF SE, Porocel Industries, Honeywell International Inc., and Sumitomo Chemicals. Company profiles include attributes such as company overview, number of employees, brand overview, key competitors, business overview, business strategies, recent/key developments, acquisitions, and financial overview (wherever applicable).